After my journey last year down into the jungles of the Amazon in Peru and participating in 5 Ayahuasca healing ceremonies with Shamans – I had asked God-Spirit for something more accessible for westerners to be able to interact with Ayahuasca in a truly supportive healing environment that wouldn’t be too foreign or alien for them. That clicked for me…a way for Ayahuasca to spread Her work more easily. 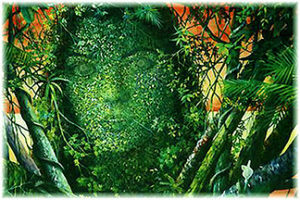 During my first ceremony with Ayahuasca She appeared to me very much like the maiden in the above picture , looking in on me as if seeing who this new soul coming to interact with her was. The medicine was just starting to affect me and I was beginning to peer into other dimensions and apologized to her if it truly was her and I wasn’t able to recognize her.